Tired of Turkey? 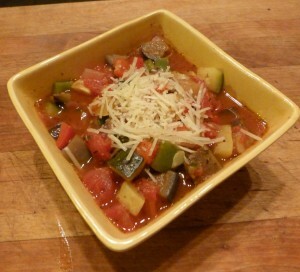 Then Ratatouille! Feeling stuffed from the feast fest? Then I’ve got a recipe for you. 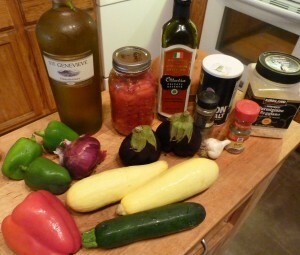 Actually Ratatouille is a Provencal vegetable dish made by the French. You can serve it hot or cold, but I prefer it hot with some nice crusty whole grain bread. It’s also the perfect summer dish when you garden abounds with all these things. When I made this last night, I couldn’t get over the fresh smell from all the vegetables. Simply delightful. This recipe comes straight out of The Ultimate Southern Living Cookbook which is my go-to cookbook for most recipes. The only difference in my recipe is I leave out the black olives. Just not an olive fan. Of course it includes wine – it’s a French dish! 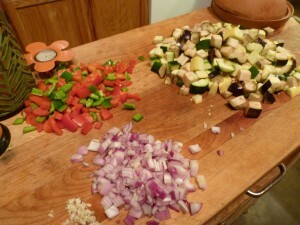 The soup only takes 15 minutes to cook, but the chopping takes lots longer. That’s okay because think how many calories your arm will burn off! 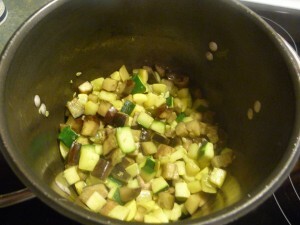 Cube the eggplant, zucchini and squash. You don’t have to peel or soak the eggplant. Just cube it. 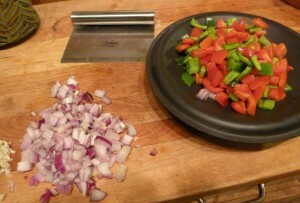 Then chop up the peppers, onion and garlic. This recipe calls for yellow pepper too, but I didn’t have any. Figured the yellow squash would give me that pretty yellow color anyway. 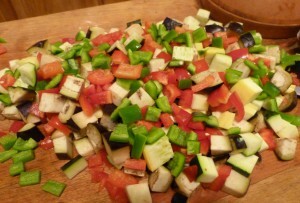 I thought it would make a pretty picture to show you all the vegetables chopped up and in a big pile. Then I went back and read the recipe. 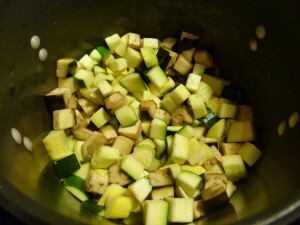 You cook the eggplant, zucchini and squash first so I spent another 10 minutes separating everything. Oh brother. 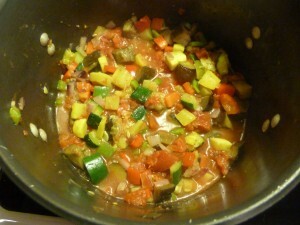 Heat the olive oil in a a large Dutch oven and add the first three ingredients. This recipe calls for 1/4 cup of olive oil. I used less than half of that. Saute for 8 minutes and it will look like this. Guess that’s the French part. Then you add the peppers, onion and garlic and saute again. But hold that thought. Let me show you a handy trick I came up with. My cutting board isn’t close to my stove, so it’s a hassle to get chopped things over to the pot. Dirty a dish? Why bother. Just take the lid and put your vegetables in that to transfer. I used that handy little Graham Kerr chopper thingy. I think Dearly Demented Mom got that off the Food Network or something. It’s great for scooping things up. Now back to the recipe. And have cooked down for another 8 minutes. Next add the tomatoes and the rest of the ingredients. Then simmer the whole thing for 15 minutes and you are done. You can top it with some grated Parmesan cheese if you’d like. Here’s the official recipe. Remember, I skipped the olives. Saute first 3 ingredients in hot oil in a large Dutch oven for 8 minutes. 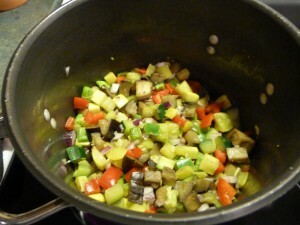 Add peppers, 0nions and garlic; saute 8 minutes more, stirring occasionally. 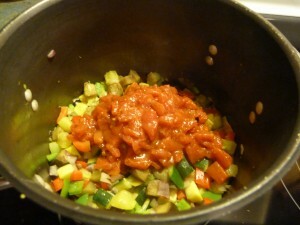 Add tomatoes and the next 5 ingredients, cover, reduce heat to medium and simmer 15 minutes or until tender. Discard bay leaf. Ladle into bowls and top with cheese, if desired. Yield: 10 servings.